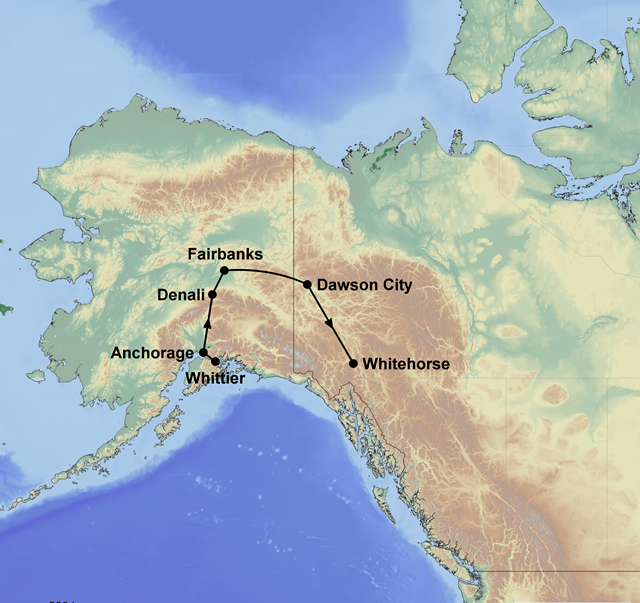 Immerse yourself in Alaskan scenery on this 11-day tour from Anchorage through to Whitehorse. Your wildlife adventures begins with a Prince William Sound Tour. After stepping aboard the Alaska Railroad you'll enter the heart of Denali National Park on a Tundra Wilderness Tour. Step back in time on the Riverboat Discovery in Fairbanks as you learn about Native Alaskans, before heading along the world renowned “Top of the World” Highway to historic Dawson City. Colourful buildings and wooden boardwalks take you back to life in the 1800s during the Klondike Gold Rush. Accommodation in clean and comfortable hotels with private facilities, meals as indicated (B=breakfast, L=lunch, D=dinner), Prince William Sound Cruise including coach transfers, Alaska Railroad: Anchorage/Denali, Denali/Fairbanks, Denali Tundra Wilderness Tour, Riverboat Discovery Cruise, Alpenglow Alaska Shuttle Service: Fairbanks/Dawson City, Dawson City/Whitehorse. Depart Anchorage by coach for a day tour to Whittier, where you can enjoy a Prince William Sound Cruise. There is spectacular glacier viewing through areas such as College and Harriman Fjords and narrated presentation on the abundant marine life. There are countless opportunities for photography before returning to Anchorage. 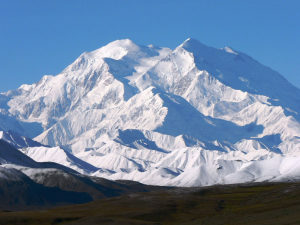 This eight hour tour takes you approximately 80km into the heart of Denali National Park. You will pass beautiful scenery, such as Sanctuary River, Teklanika and Polychrome Pass. Wildlife such as bear, moose, caribou and wolves may be spotted during the course of the tour. Access into the park is restricted in order to protect the wildlife and surrounding environment. Board the Riverboat Discovery for a cruise down the lovely Chena River. This tour includes a visit to a recreated Chena Indian Village and demonstration of dog sledding. Time at leisure. The town of Dawson City became famous during the Klondike Gold Rush late last century and has been declared a national historic site. There are many classified properties such as the homes of Jack London, Robert Service and Pierre Berton. Another attraction is the Discovery Claim, home to the richest placer gold strike in history.